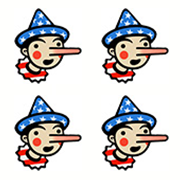 We can’t quite fact check the statement above — it’s certainly open to debate what counts as achievements — but we can fact-check 15 dubious claims made by the president in his lengthy news conference. Some of these are from his greatest hits of falsehoods, which we have fact-checked many times before. The claims are addressed in the order in which Trump made them. Trump has a tendency to focus only on polls that are good for him. Rasmussen has a right-leaning bias and earns a C+ grade from FiveThirtyEight.com. Other polls show Trump with significantly lower approval ratings, such as Gallup (40 percent) and Pew Research Center (39 percent). The state of foreign policy is open to interpretation — Trump claimed he was developing “a plan for the defeat of ISIS,” the terrorist group in Iraq and Syria. This statement is wrong on several levels. Trump ended up with 304 electoral votes, because two electors he earned voted for someone else. There’s no official definition of “sanctuary,” but it generally refers to rules restricting state and local governments from alerting federal authorities about people who may be in the country illegally. Immigration enforcement is a federal responsibility, and state and local law enforcement can decide how much they want to cooperate with the federal government for immigration enforcement. There are between 165 and 608 local and state governments with sanctuary policies, and they vary in their approach. A handful of studies looked at whether there is a causation between sanctuary cities and crime. They either found no statistically significant impact of sanctuary policies on crime, or a reduction in crime due to immigrant-friendly policing strategies. Sanctuary jurisdictions release inmates after their criminal case is complete, and extensive research shows that noncitizens are not more prone to criminality than U.S.-born citizens. Moreover, some sanctuary jurisdictions do cooperate with the federal government if they believe the inmate is a public safety threat. Each court’s reversal rate changes every year, so it’s easy to cherry-pick this data. Under Chief Justice John G. Roberts Jr., the 9th Circuit court did not set a “record” for reversals. The 9th Circuit’s reversal rate was usually higher than the average, but not always the highest. In the 2014-2015 term, the 9th Circuit’s reversal rate was 63 percent, below the average rate of 72 percent. In the 2015-2016 term, the latest year of data available, the 9th Circuit court’s reversal rate was 80 percent, and the average rate was 67 percent. Most cases that are reviewed by the Supreme Court are reversed. For this reason, a 2010 analysis by the American Bar Association also looked at the number of cases reversed in each appellate court compared to the total number of cases terminated by the appellate court. From 1999 to 2008, 80 percent of 9th Circuit court cases reviewed by the Supreme Court were reversed (compared to the median rate of 68.3 percent). But the number of reversed cases represented only one-fifteenth of 1 percent of the total number of appeals terminated by the 9th Circuit Court during that 10-year period. Trump indicated that he wasn’t sure if this assertion is correct. It is not. The public’s trust in the media has certainly fallen over the years. But a 2016 Gallup poll shows that Congress is viewed positively by 9 percent of respondents, compared to 20 percent for newspapers and 21 percent for television. That’s not a high confidence level — besides Congress, only “big business” ranks lower than the media — but it’s enough to make Trump’s claim incorrect. WikiLeaks actually released hundreds of thousands of classified State Department cables, in a significant blow to U.S. diplomacy. Trump overstates the disclosure about Clinton reportedly getting a single debate question. During the Democratic primaries, a debate was held in Flint, Mich., to focus on the water crisis. Donna Brazile, then an analyst with CNN, sent an email to the Clinton campaign saying that a woman with a rash from lead poisoning was going to ask what Clinton as president could do the help the people of Flint. 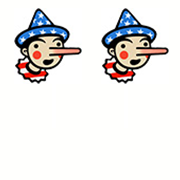 Trump repeated this claim, worthy of Four Pinocchios, several times during the news conference. An entire chapter is dedicated to this uranium deal in Peter Schweizer’s “Clinton Cash.” In the book, Schweizer reveals ties between the Clinton Foundation and investors who stood to gain from a deal that required State Department approval. Trump’s claim suggests the State Department had sole approval authority, but the department is one of nine agencies in the Committee on Foreign Investments in the United States to vet and sign off on all U.S. transactions involving foreign governments. As we’ve noted before, there is no evidence Clinton herself got involved in the deal personally, and it is highly questionable that this deal even rose to the level of the secretary of state. The Nuclear Regulatory Commission also needed to approve, and did approve, the transfer. Trump appears to have forgotten that imprecise wording in the executive order led to confusion over whether U.S. permanent residents — green-card holders — were also banned from returning to the United States. The White House counsel later issued guidance making clear that they were not covered. The Court of Appeals later said that the counsel’s statement was not a sufficient fix. Trump also is being misleading when he says has “nothing to do with Russia.” Trump repeatedly sought deals in Russia. In 1987, he went to Moscow to find a site for a luxury hotel; no deal emerged. In 1996, he sought to build a condominium complex in Russia; that also did not succeed. In 2005, Trump signed a one-year deal with a New York development company to explore a Trump Tower in Moscow, but the effort fizzled. “Inner cities” is not a category by which crime is measured, and Trump often uses this term to refer to large, urban cities. In 2016, there was an uptick in the homicide rate in the 30 largest cities. One outlier city — Chicago — was responsible for 43.7 percent of the total increase in homicide rates in 2016. Overall, violent crime is on a decades-long decline, since the height of the crack cocaine epidemic in the early 1990s. The homicide rate in the 30 largest cities also increased in 2015, but the two-year trend does not indicate the return of a crime wave in “inner cities.” Crime trends can randomly fluctuate year to year, and criminologists consider the data over much longer periods of time — at least 10 to 15 years — to draw conclusions about trends. We explored Trump’s exaggerated rhetoric on crime here. “We had to go quicker than we thought because of the bad decision we received from a circuit that has been overturned at a record number. I have heard 80 percent." "I have nothing to do with Russia."